Comité Mision Roja is pleased to announce the results of their very successful third annual Carrera Para La Cruz event in Huatulco, Oaxaca, on the 22nd of January, 2012. 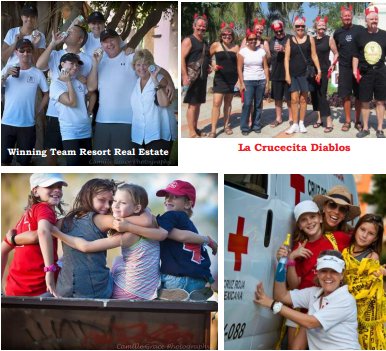 Comité Mison Roja 2011/2012 committee volunteers reflected the great cross-section of Huatulco’s vibrant community. They were: Valerie Verhalen, Nancy Norris, Kathy Taylor, Araceli Garcia Hernandez, Pat Hudson, Gerry Freund, Kimberly Shearwater, and Caryl Coffey. While Huatulco is not what one would refer to as a “dancing on tables” kind of place, its sedate image was recently blown out of the water when Un Nuevo Amanacer hosted a benefit concert/party on Jan 28. Playing to a packed house, David Rotundo’s Blues Band literally had the joint jumping. It was a mixed crowd spanning several generations and I don’t know when I have seen so many people over 50 shaking it up with such abandonment. The benefit was the brain child of Chris Daoust who discovered that the group had a few days between gigs in the region. With the help of a few enthusiastic individuals and committed business owners over 300 tickets were sold at 150 pesos each. Los Vaqueros should be commended for donating their restaurant space in La Crucecita, along with a mountain of ice. It was originally hoped that after expenses something in the range of 40,000 pesos might be raised. The lively crowd consumed that much in snacks and beverages alone. One of the Huatulco’s more attractive hotel managers, assisted by two enterprising accomplices, added impromptu fun to the fundraising endeavors; using the long tables as cat walks they shook their booty as bills of various currencies were enthusiastically “donated”. This sport added 12,620 pesos to the pot. In total 111,300 pesos were taken in with a net profit of 75,150 pesos were raised for Un Nuevo Amanacer, a non profit organization helping disabled children in an around Huatulco. That is what you call community spirit.